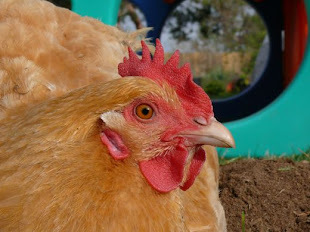 Chicken Blog: Spring is Calling! You'll find us outside. Without looking at the calendar, or referencing charts and graphs, I declare: Spring has sprung, and we are embracing the season, the air, the activities, the flight of the all the Painted Lady butterflies, the pea shoots, the longer days. Last night William and Geoff finished mixing and pouring the concrete for the floor posts of the barn. It was the kind of labor with both heavy lifting, and gentle touches, as they leveled and measured every post setting. It was probably more fun, when the chickens were out, and Maria was squealing and running in the hose spray. William and Geoff definitely outlasted all of us. The work took all day, and they came in very tired. My tools have been in the front yard, where I dug up shrubs, turned the soil, then prepared it for a flower and veggie bed. Am I setting myself up for bitter resentment of nature? These won't be in raised beds. I am tempting the rabbits, sparrows, crows, gophers, and cats with all these lovelies. It must be a sickness of Spring that dares me to labor and toil for a project so perilous! Even the chickens have been known to find their way into the front yard, and it will only take one slip up like that to wreak total havoc on my progress. I think it's the zinnias. The beauty of zinnias is a sufficient intoxicant to make me recklessly dig, pull roots, drag a hose, lift, haul, and garden. Meanwhile, in the backyard, everyone takes a turn inspecting the work of laying out the barn. Benjamin walks the line, making sure to test the level and tension of the strings. He surveys from west to east, then doubles back. Following the cat, the chickens walked through and peered down all twelve post holes, sometimes back-filling holes that looked too deep, in their humble opinions. The chicas may have "humble opinions," but they do not have informed opinions, and the foreman told them to scram. William, Alex, Max, and Eli standing back to see whether the barn should be measured parallel and aligned to the fence, or if Natalie was right, and the barn should be surveyed in a more organic-wibbly-wobbly way. It was unanimous: definitely wibbly-wobbly. Geoff still measured and aligned, but everyone agreed that turning the barn slightly, to face the back of the house, felt better. One more thing we agree on: a barn raising party. Never pass-up on a barn party. Never pass-up on calling a largish shed a "barn." And never pass-up on being outdoors when Spring calls. Hello from Sunnyvale! We are visiting granddaughter. Love your flowers and the barn raising with banjo. Hi Natalie! That is so very exciting putting in a new barn...and wow - putting in the garden already?? surely not here - we are just now burning the prairie - you must be in California?